Martin Luther (/ˈluːθər/; German: [ˈmaɐ̯tiːn ˈlʊtɐ] 10 November 1483 – 18 February 1546) was a German professor of theology, composer, priest, monk and a seminal figure in the Protestant Reformation. 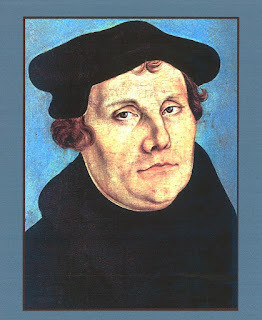 Luther came to reject several teachings and practices of the Roman Catholic Church. He strongly disputed the claim that freedom from God's punishment for sin could be purchased with money, proposing an academic discussion of the practice and efficacy of indulgences in his Ninety-five Theses of 1517. His refusal to renounce all of his writings at the demand of Pope Leo X in 1520 and the Holy Roman Emperor Charles V at the Diet of Worms in 1521 resulted in his excommunication by the Pope and condemnation as an outlaw by the Emperor. Luther taught that salvation and, subsequently, eternal life are not earned by good deeds but are received only as the free gift of God's grace through the believer's faith in Jesus Christ as redeemer from sin. His theology challenged the authority and office of the Pope by teaching that the Bible is the only source of divinely revealed knowledge from God and opposed sacerdotalism by considering all baptized Christians to be a holy priesthood. Those who identify with these, and all of Luther's wider teachings, are called Lutherans, though Luther insisted on Christian or Evangelical as the only acceptable names for individuals who professed Christ. His translation of the Bible into the vernacular (instead of Latin) made it more accessible to the laity, an event that had a tremendous impact on both the church and German culture. It fostered the development of a standard version of the German language, added several principles to the art of translation, and influenced the writing of an English translation, the Tyndale Bible. His hymns influenced the development of singing in Protestant churches. His marriage to Katharina von Bora, a former nun, set a model for the practice of clerical marriage, allowing Protestant clergy to marry. Martin Luther was born to Hans Luder (or Ludher, later Luther) and his wife Margarethe (née Lindemann) on 10 November 1483 in Eisleben, Saxony, then part of the Holy Roman Empire. He was baptized as a Catholic the next morning on the feast day of St. Martin of Tours. His family moved to Mansfeld in 1484, where his father was a leaseholder of copper mines and smelters and served as one of four citizen representatives on the local council. The religious scholar Martin Marty describes Luther's mother as a hard-working woman of "trading-class stock and middling means" and notes that Luther's enemies later wrongly described her as a whore and bath attendant. He had several brothers and sisters, and is known to have been close to one of them, Jacob. Hans Luther was ambitious for himself and his family, and he was determined to see Martin, his eldest son, become a lawyer. He sent Martin to Latin schools in Mansfeld, then Magdeburg in 1497, where he attended a school operated by a lay group called the Brethren of the Common Life, and Eisenach in 1498. The three schools focused on the so-called "trivium": grammar, rhetoric, and logic. Luther later compared his education there to purgatory and hell. In accordance with his father's wishes, Luther enrolled in law school at the same university that year but dropped out almost immediately, believing that law represented uncertainty. Luther sought assurances about life and was drawn to theology and philosophy, expressing particular interest in Aristotle, William of Ockham, and Gabriel Biel. He was deeply influenced by two tutors, Bartholomaeus Arnoldi von Usingen and Jodocus Trutfetter, who taught him to be suspicious of even the greatest thinkers and to test everything himself by experience. Philosophy proved to be unsatisfying, offering assurance about the use of reason but none about loving God, which to Luther was more important. Reason could not lead men to God, he felt, and he thereafter developed a love-hate relationship with Aristotle over the latter's emphasis on reason. For Luther, reason could be used to question men and institutions, but not God. Human beings could learn about God only through divine revelation, he believed, and Scripture therefore became increasingly important to him. He later attributed his decision to an event: on 2 July 1505, he was returning to university on horseback after a trip home. During a thunderstorm, a lightning bolt struck near him. Later telling his father he was terrified of death and divine judgment, he cried out, "Help! Saint Anna, I will become a monk!" He came to view his cry for help as a vow he could never break. He left law school, sold his books, and entered a closed Augustinian cloister in Erfurt on 17 July 1505. One friend blamed the decision on Luther's sadness over the deaths of two friends. Luther himself seemed saddened by the move. Those who attended a farewell supper walked him to the door of the Black Cloister. "This day you see me, and then, not ever again," he said. His father was furious over what he saw as a waste of Luther's education. In 1507, he was ordained to the priesthood, and in 1508, von Staupitz, first dean of the newly founded University of Wittenberg, sent for Luther, to teach theology. He received a bachelor's degree in Biblical studies on 9 March 1508, and another bachelor's degree in the Sentences by Peter Lombard in 1509. In 1516, Johann Tetzel, a Dominican friar and papal commissioner for indulgences, was sent to Germany by the Roman Catholic Church to sell indulgences to raise money to rebuild St. Peter's Basilica in Rome. Roman Catholic theology stated that faith alone, whether fiduciary or dogmatic, cannot justify man; justification rather depends only on such faith as is active in charity and good works (fides caritate formata). The benefits of good works could be obtained by donating money to the church. However, this oft-quoted saying of Tetzel was by no means representative of contemporary Catholic teaching on indulgences, but rather a reflection of his capacity to exaggerate. Yet if Tetzel overstated the matter in regard to indulgences for the dead, his teaching on indulgences for the living was in line with Catholic dogma of the time. The Latin Theses were printed in several location in Germany in 1517. In January 1518 friends of Luther translated the Ninety-five Theses from Latin into German. Within two weeks, copies of the theses had spread throughout Germany; within two months, they had spread throughout Europe.